―What is your image of PIAA? ―What is your impression using PIAA lighting system? Latvla: A very bright lamp. A lamp which can cover a broad range. There are many lamps reaching far distance but PIAA lighting system also gives strong light to the close range, I can easily find obstacles when turning. Also, the beam color is natural and gives less stress to the driver’s eyes. With PIAA, I can drive with confidence. This is a great advantage when racing in a dark environment. ―What is the next challenge of PIAA lighting system? 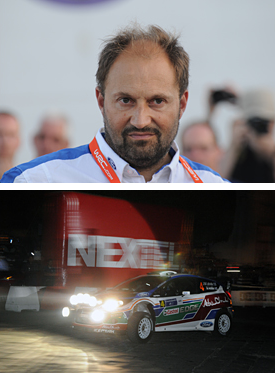 Latvla: As a racing driver, I do not find any issues with PIAA lighting system. I Think this the best lamp for rally competition. Hirvonen: I was using PIAA in 2004 when driving with SUBARU team, Started to notice more when FORD team started to use PIAA lights from 2009. I knew PIAA is a Japanese brand. Not only SUBARU, but FORD also uses PIAA. I think PIAA has a very professional, international image. Hirvonen: A strong output lamp. Also highly reliable as I never had any trouble related to lighting. With a reliable lighting system, I can drive the night stages with confidence. Hirvonen: I do not have any negative issues with PIAA lighting system. 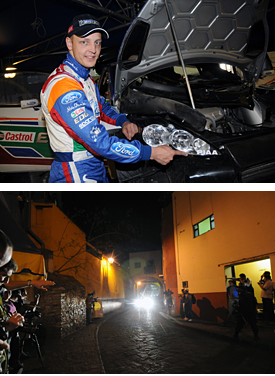 Recently there are not so many night rally stages, but we are able to race them with the best lights. 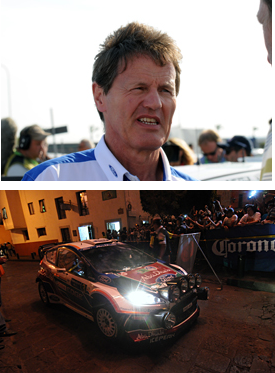 Loriaux: PIAA has been supplying lamps to the top rally teams such as SUBARU, MITSUBISHI works team. For me, PIAA has a strong rally image. ―Why did you select PIAA lighting system? Loriaux: Simple reason, We tested the lamps and PIAA showed very high performance. I already knew PIAA lamps are bright and durable since I was racing with SUBARU team before. When PIAA became the lighting supplier for FORD team in 2009, PIAA quickly developed a lighting system for FOCUS. I think PIAA is a professional supplier with rich knowledge and experience of rally competition. Loriaux: I have some ideas making modifications, making the lamp even better. Will try them out with PIAA engineers. ―Why did you select PIAA as a technical supplier in 2009? Wilson: PIAA has joined the team as a supplier from 2009, but I have much longer relation with PIAA. The first time was when I was still an active racing driver. Can’t exactly remember when but I have been using PIAA lights from the 1990s. There were many night stages back when I was an active racer. PIAA was already known for the bright, strong output since my days. 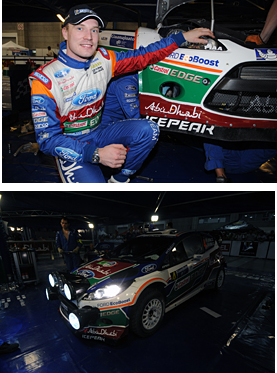 After retiring as a racer, I still had a good impression of PIAA, it is a great pleasure to be able to race together again in the rally with PIAA from 2009. Rally competition always needs strong, reliable lamps. PIAA is a great partner. ―What is the Feature of PIAA? Wilson: A bright, durable lamp. This has not changed since I was an active racer. Still today, PIAA offers the best lighting system. Wilson: Not only the lamp’s performance, PIAA engineers has very advanced skills, and quickly reacts to problems. As a team manager, I am very happy with PIAA.